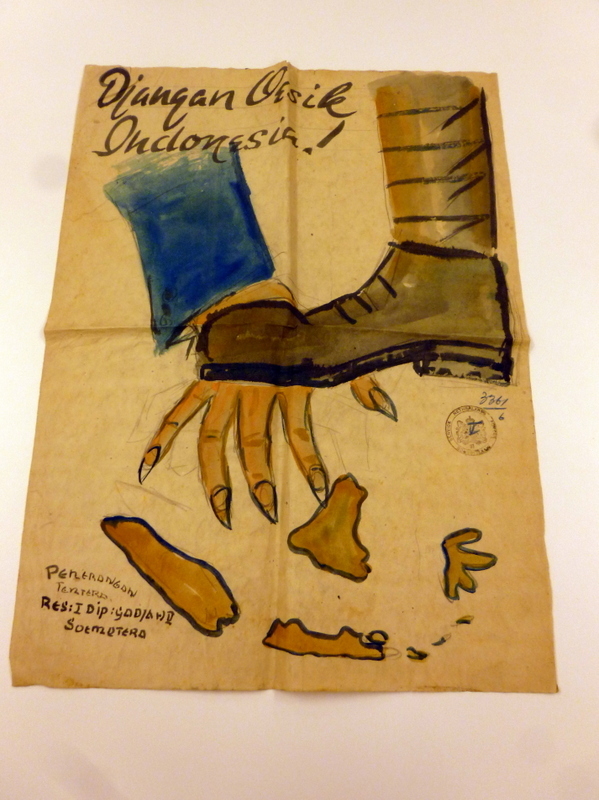 Among all this new interest for the war in Indonesia, the principal focus has been the extent to which Dutch forces committed atrocities against Indonesian civilians and combatants. That atrocities such as summary executions, torture, widespread arson, etc., were a structural part of Dutch military practice has been well documented. But surprisingly, despite all this attention upon Dutch atrocities, the Indonesian victims remain hidden. Dutch historiography and Dutch public memory continue to enjoy a highly Eurocentric view on the war in Indonesia. More than ever before, the black chapters of Dutch history can now be discussed. But still, the public debate is highly inward-looking. The main interest is in ‘our’ atrocities in the colonies, in ‘our’ guilt and what ‘we’ should now do about it. Meanwhile the other, the Indonesian, is still no more than an extra on the stage of Dutch history, lacking a face or and autonomous historical agency. Nowhere is this absence of Indonesian faces more obvious than in the absence of Indonesian victims from Dutch memory culture. We haven’t even had a reliable estimate of Indonesian casualties during the decolonization war – until now. Seven decades after the fact, we’ve had no reliable estimates of the number of Indonesians who died in the war. By contrast, Dutch military casualties have been meticulously counted: 4,751 soldiers from the metropolitan and colonial army died (approximately half through battle-related causes and the other half as the consequence of disease or accident). Dutch civilian casualties (including Eurasians) are much more uncertain, with estimates ranging from 5,000 to 30,000, but at least debate about these numbers is vibrant and ongoing. But until today, no one – in the Netherlands or in Indonesia – has ever seriously attempted to calculate the number of Indonesian casualties. In other words, Dutch professional historians are also to blame for the missing Indonesians in our narratives of the decolonization war. Meanwhile, the lack of reliable research into the number of Indonesian victims has not pre-empted the use of very rough estimates. Many historians have had the understandable urge to come up with a number, if only to give their readers a sense of the scale of the war. The number that has become canonical for this purpose is an estimate of 100,000 Indonesian casualties. But this number is a complete fabrication, without a traceable basis in reliable sources. The origin of this ‘100,000’ is to be found in a footnote of Volume XII of the monumental official Dutch history of the Second World War Het Koninkrijk der Nederlanden in de Tweede Wereldoorlog (1988), by famous historian and public intellectual Loe de Jong. De Jong wrote: ‘In Indonesia, it is posited that Republican forced lost a total of ca. one hundred thousand men in the years ’45-’49 – Dutch military historians consider this a reliable number.’ De Jong cited no sources, nor did he mention which Indonesian or Dutch historians he had consulted. But the career of ‘100,000’ really took off when, several years ago, it was included in a webpage of the NIOD Institute for War, Holocaust and Genocide Studies (this website has since been updated in order to reflect the preliminary nature of this number). Many authors looking to quickly put a number on the Indonesian death toll ended up here. And as De Jong’s number found its way into the works of others, his claim that ‘historians’ regarded it as ‘reliable’ gradually became a self-fulfilling prophecy. Curiously, various authors disagree as to whether the ‘100,000’ refer only to the Indonesian victims of Dutch military violence, or whether this number also includes the victims of internal Indonesian conflicts. The years of the decolonization war also saw a whole range of clashes between various Indonesian parties: communists, islamists, nationalists, regionalists, etc. De Jong’s original guesstimation seems to refer only to victims of Dutch violence, but some later historians (e.g. Remco Raben and Gert Oostindie) have suggested that casualties of violence among Indonesians should also be included under the 100,000. Some historians, however, have bucked the trend of ‘100,000’. Some have instead wisely refused to put a number on the death toll at all. Most others at least emphasize profusely that the estimate of 100,000 is a ‘wild guess’ (Gert Oostindie’) or a ‘rough approximation’ (Rémy Limpach). Economic historian Pierre van der Eng once calculated that the demographic gap for the entire 1940s in Indonesia comes to about 2.4 million: a sign that not only violence of both the world war and the decolonization war, but also starvation and general deprivation took a heavy toll. The Australian historian Adrian Vickers surveyed mostly Indonesian historiography and thus came to a broad estimate of 45,000-100,000 military casualties plus 25,000-100,000 civilian casualties for the period 1945-1949. The available source material in the Netherlands, while highly fraught, allows us to come to a more reliable result than Loe de Jong’s ‘wild guess’. The most complete and consistent sources in the Dutch archives are the regular military operation reports. Field commanders were required to faithfully register the numbers of ‘enemy casualties’ (dead, wounded, or captured enemy combatants). These numbers were accumulated by the high command, and ultimately brought together in ‘regional surveys’ by the Headquarters of the General Staff (HQGS). With the exception of the first few chaotic months (Sept-Dec 1945), the HQGS surveys were kept throughout most of the conflict and almost all have been preserved. The only historian who has previously made use of these sources was Petra Groen. In her Marsroutes en Dwaalsporen (Marching Routes and Stray Paths, 1992) she used the operation surveys to calculate the casualty numbers on Java and Sumatra in the period from 1 January 1949 to 10 August 1949. In those seven months alone, she came to a total of 46,818 Indonesian deaths. Since then, no one has apparently felt the need to continue Groen’s work for the earlier period of the war, even though the operation surveys have been publicly available in the Dutch military archive for anybody to study for several decades now. The number of 97,421 Indonesians killed comes surprisingly close to Loe de Jong’s wild guess. So was De Jong right after all? Yes and no. The guess of 100,000 does indeed seem to be in the correct order of magnitude. But for several reasons we strongly suspect that the 97,421 that emerges from the Dutch military reports is the lower limit of the real death toll, rather than an accurate estimate in itself. First of all, the many layers of the military bureaucracy regularly caused inaccuracies. Numbers reported on the lowest levels did not always reach the top of the military hierarchy in time to be included in the weekly reports. As a consequence, our table shows a number of notable gaps, in which certain regions did not report any enemy losses sometimes for weeks at a time, even though we know that fighting was taking place. One example: we know from lower level reports that the town of Tanjung Balai (North-Sumatra) was taken by Dutch forces on 4 August 1947, at the cost of 300 Indonesian lives. But in this week, the Head Quarters did not report any numbers from the region of North-Sumatra. A similar pattern emerges in a sample of cases. Overall, where the numbers of the HQGS are incorrect, they clearly skew towards underreporting rather than overreporting. Secondly, the military operation surveys only include the reports submitted by regular army units, not any ‘enemy losses’ that may have been caused by police units, auxiliaries, or paramilitary organizations – and there were many of such units active during the Indonesian decolonization war! For instance, historian Willem IJzereef concluded already in the 1980s that the infamously brutal counterinsurgency campaign on South-Sulawesi in early 1947 likely caused the death of approximately 6,500 Indonesians. The numbers of the HQGS only come to 3,256. The difference is caused mostly by the fact that several auxiliary forces active in this region are not included in the official cumulative reports. The final reason why we think that 97,421 is a lower limit estimate derives from the nature of the military enemy counts. The field commanders were explicitly instructed only to report enemy losses that had actually been counted, and to leave out estimates of additional enemy losses. Although not all field commanders will have followed this instruction to the letter, it seems that the majority did stick to this guideline. And the differences between counted enemy losses and estimated enemy losses could be significant. The large numbers of casualties caused by artillery fire and other forms of long-range violence were often not registered: those deaths occurred away from the own positions and could therefore often not be counted. For example, on 19 October 1947, a sweep-operation was executed by Dutch forces in and around Karanganyar (Central Java). The operation started with intensive artillery shelling. At its conclusion, a total of 124 enemy dead were counted, but: ‘not including the deaths caused by artillery fire’. The field commander explained that artillery had probably killed another ±500, but he had not been able to confirm that with a count. If you visit the city of Karanganyar itself nowadays, a monument on the central square commemorating the attack reports a total of 784 victims, although it is unclear what this number is based on. So the numbers are unclear, but sizeable. 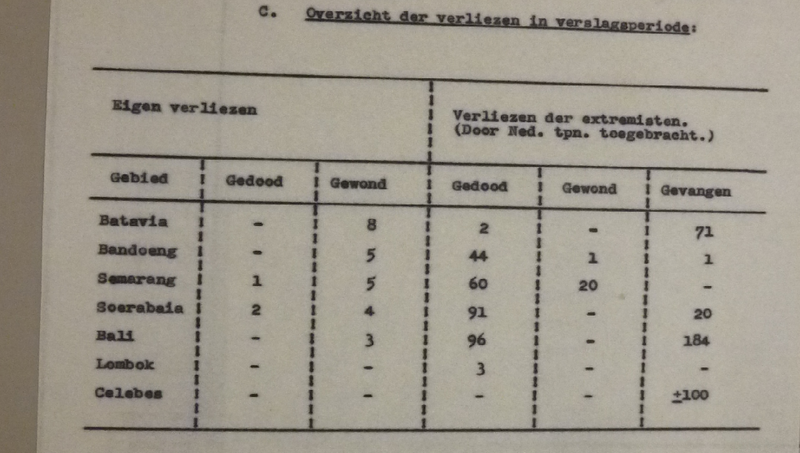 But HQGS in its survey only included the count of 124 enemy losses. Overall, then, there are good reasons to assume that our count presents a lower limit estimate. However, we must also consider that in some cases the numbers reported from the field were artificially inflated. Field commanders could be tempted to exaggerate the ‘body count’, as this number is one of the few clear metrics they could present for military ‘success’: high enemy losses show your superiors that you are taking your job seriously. This phenomenon of inflated body counts is well known especially from the Vietnam War. We cannot rule out entirely that it also occurred in Indonesia. It does, however, seem unlikely that it happened structurally or on a large scale. In contrast to the American army command in Vietnam, the Dutch army leadership never explicitly presented the body count to its field commanders as a measure of success. To the contrary, the higher military command frequently admonished lower ranks to report accurately. Our new count of 97,421 Indonesian casualties (both civilians and combatants) therefore should be seen as a first step. One important thing to note is that these numbers do not include the additional deaths as a consequence of internal conflicts between various Indonesian warring factions. The estimate only concerns the victims of Dutch military violence. The numbers in our table can be further completed and sharpened on the basis of fine-grained, region-by-region, and period-by-period study. That will require further detailed research. The Netherlands likes to present itself as an international leader in the field of human rights. Inspiration for that position is often taken from the ‘lessons’ of the Second World War. But if the Netherlands wants to be credible in that role, it will also have to face its own historical failures. The victims of Dutch military actions in Indonesia are part of that history. The time and effort of counting and of painstaking research should be spent on both sides of the decolonization war. Moreover, such efforts are necessary if the Netherlands wants to give its history of colonization, imperialism, and decolonization a proper place in its own collective historical consciousness. Indonesians were not just extras on the stage of Dutch history. They played a leading role. A slightly adapted Dutch version of this article was published in Dutch news weekly De Groene Amsterdammer on 27 July 2017. It should not be forgotten that British troops were also involved in the early stages of the Indonesian conflict. The Dutch were still reorganising themselves following WW2 and (I have not checked sources here ) therefore the liberation of Indonesia from Japanese occupation was undertaken by Mountbatten’s South East Asia Command. It was not until 1948 that the Dutch had recovered sufficiently to take over. The actor Dirk Bogarde as a war service Captain was awarded an MC for his part in this forgotten campaign. Indeed they were. Although it was not so much the liberation of Indonesia, but rather the re-occupation after the Japanese had already capitulated. 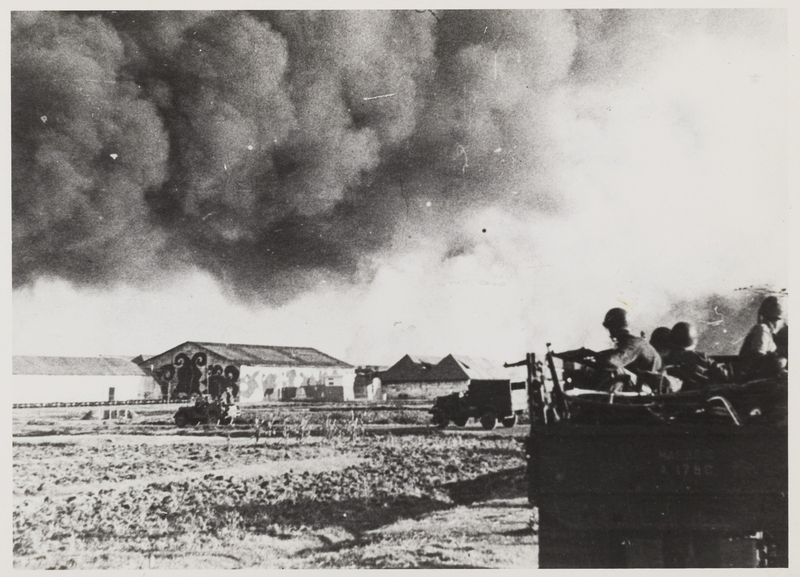 The main tasks for the British forces (consisting for a significant part of British Indian forces) were supposed to be to repatriate Japanese troops and defend European civilians against Indonesian violence. But they soon saw themselves embroiled in bitter fighting with Indonesian insurgents, most famously in the battle of Surabaya (oct-nov 1945). They actually handed over command to the Dutch in mid-to-late 1946 (rather than 1948). Richard McMillan has written an excellent book on this British occupation of Indonesia. For clarity’s sake: the death toll of the British campaign in Indonesia is not included in the numbers described in this article.